That scarf is so cool! I love the way it looks coming out of your cardigan like that. So awesome. Love it! Is that a scarf or is it part of the sweater? I love that scarf. It is so kitschy and really makes your outfit stand out! And your sunglasses are adorable! Ohh nice casual outfit...I like it...where are the sunnies from? Raybans? miss you girl, great use of that scarf! Love the menswear inspiration here. Looks comfy and perfect for weekend fun! ooh it looks so great!! I love love the ruffle scarf and the shorts look great without the tights too! OMG...love this outfit. the shorts and the boots are super cute, but its the scarf thats nails the look. LOVE!!! 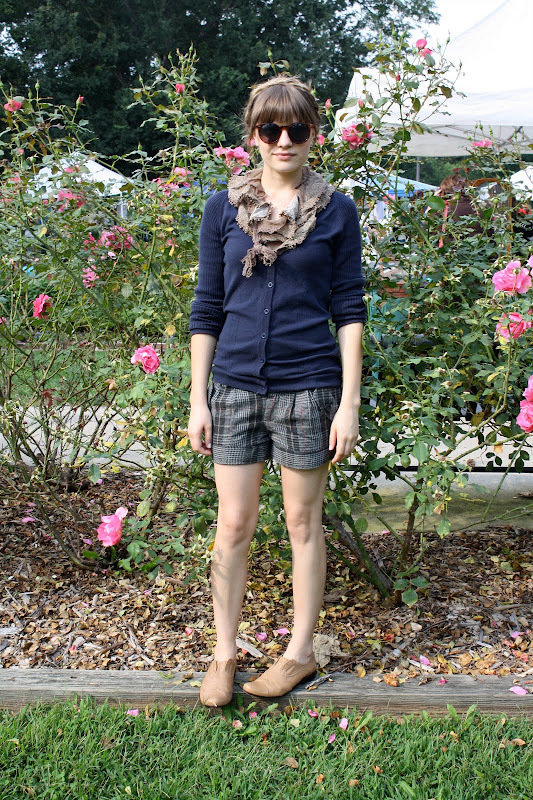 The plaid shorts/scarf/navy top are just perfect together. I tried to do my hair like this today, but I looked more "Heidi" (the movie) than chic. But I love this hairstyle on you. those shoes are awesome. im in love.